1. 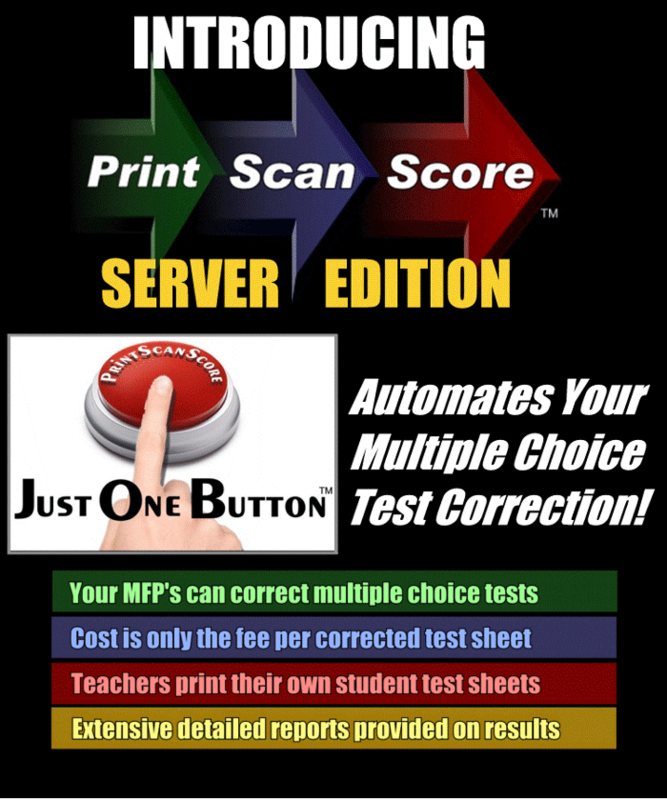 The PrintScanScore simply a Multiple Choice Testing program installed on your network server and each instructor can run the program on their PC. The first time the program is used, instructors input a personal password that makes their testing information private to them. 2. Each instructor initially creates a listing of students for each of their classes. This class list is used to populate the individual student test sheets when printed on any network-connected printer. These test sheets include the test name, the student name, the instructor name, the date of the test, and the number of bubbles needed for the number of questions on the test. There is also a unique bar code at the top of the form that identifies each individual test sheet to the program. 3. The test is given to the students and the students mark the bubbles with their answers. 4. The instructor takes the completed student test sheets, along with a master test sheet with all the correct answers marked, to a Multi-Function Printer (MFP), puts the stack of test sheets into the feed tray on the top, and then presses "Just One Button" which automatically scans all the test sheets as 200 dpi, B&W, TIFF images and sends them to the program on the server. 5. The program immediately scores all the tests and generates three reports (a summary report for the class, individual student reports, and a detailed analytical report) easing the evaluation of Multiple Choice Answer Sheets. 6. The instructor returns to their PC and using their password-protected access to the server program can view the reports and/or save them as .PDF documents for later detailed viewing or printing. The cost of PrintScanScoreTM Server Edition, the Placement Test software is based on usage. . Sheet processing credits (clicks) are pre-purchased; the program then counts down the usage as each test sheet is processed. There is no capital cost involved, as the cost per sheet (click) is an operating cost. Purchased click credits are not time limited, they are good until they are used. For more details on the features of PrintScanScoreTM Server Edition software, go to the PrintScanScoreTM webpage. If you are looking for a single dedicated portable scanner with all the functionality listed above, check out the Scanner webpage. Copyright 2012, ZIP-scan, Inc. All Rights Reserved.